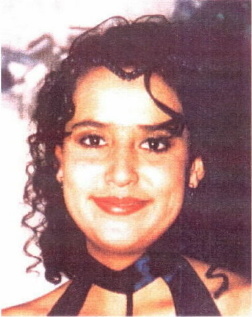 My daughter, Teresa Reyes, 17, disappeared from our apartment in Albuquerque sometime after 11 p.m. on July 1, 1998. Police call Teresa a "runaway." Our family believes she was abducted and is probably dead. Earlier that evening Teresa had been out with a girlfriend. She got home about 11 p.m., got a snack, took her medications - (Teresa is bi-polar and takes several medications on a daily basis), and went to her room. My husband and I locked up the apartment and went to bed. At about 3 a.m. I was awakened by the sound of Teresa's bedroom door banging in the breeze. The light in Teresa's room was on, TV was on and music was playing, but Teresa had left the apartment. She never returned. I talked to the girlfriend Teresa was out with that evening. She told me she and Teresa had stopped at a gas station to use the payphone, and while they were there some older guys in a cream colored van pulled up and started talking to them. The guys invited them to a party. Teresa wanted to go to the party, but the girlfriend refused and got Teresa out of there. But before they left, Teresa took a lipstick and wrote down on a napkin the phone number of where the party was being held. I am sure Teresa sneaked out to go to that party and something happened to her there. I called the police, but they said I had to wait 72 hours before I could report Teresa missing. When I called back 72 hours later, they asked me how old Teresa was, and when I said 17, they said, "Oh, then she's a runaway. Lots of girls do that." They sent a Det. Mallon to our home to talk to me, but he said that since she was a runaway they couldn't start an investigation for six months. I tried to explain that I didn't think Teresa was a runaway, because she didn't take anything with her - no money, no clothes, no purse, no make-up, and most important, she didn't take her medication.. She had to have that medication, and she knew it. Det. Mallon said if she didn't turn up in six months to let him know. 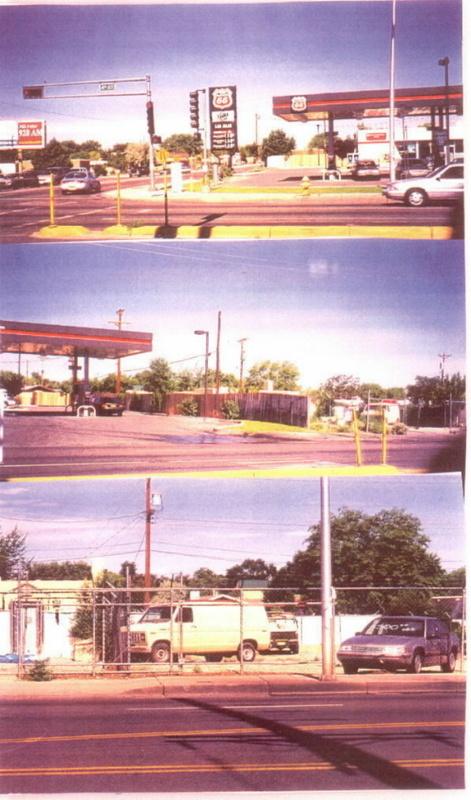 Because nobody at APD was looking for Teresa, I started looking for help in other places -- ID Resource Center of Albuquerque, Center for Missing and Exploited Children, television stations, and the Mayor's Office. I even went to the FBI. 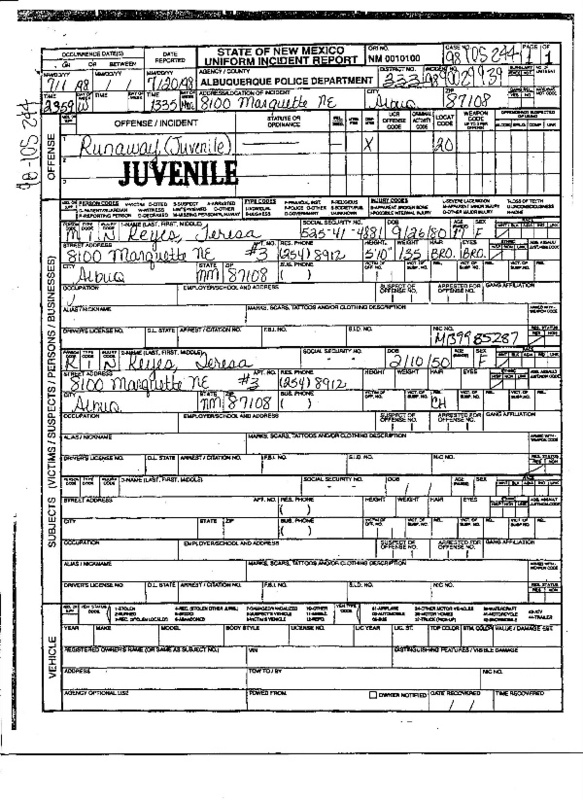 Those people would talk to APD, who would tell them that Teresa was a runaway., and they'd accept that. Like they thought the police knew Teresa better than her mother! It's true Teresa stayed away from home on a couple of occasions, (the mood swings caused by her mental disorder made her difficult to deal with), but she was never gone more than a couple of days and always called me so I wouldn't worry. Teresa is impulsive, but she is kind hearted and always reaches out to her family. She has an older brother and sister living in Albuquerque and other family in Las Cruces. There is no way in this world that Teresa would deliberately walk out of our lives and never look back. In June, 2000, we hired a private investigator who tried to reach Det. Mallon to talk about the case. Our P.I. was told Det. Mallon had been reassigned to another unit and his reports could not be found. Our P.I. then took a statement from Teresa's girlfriend - the one that was with Teresa that evening, that the police had never interviewed. The girlfriend told our P.I. 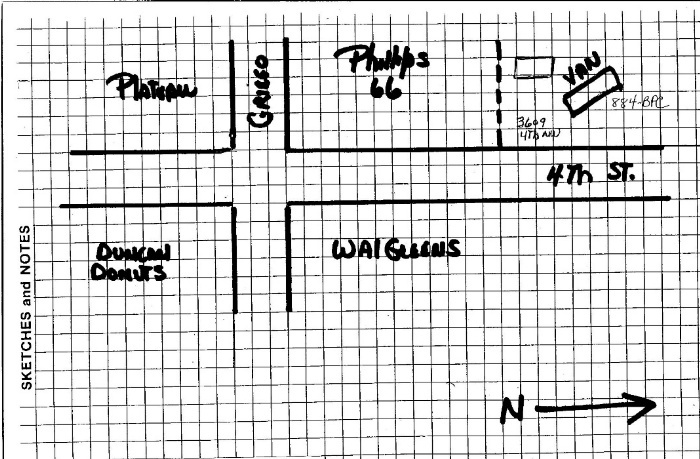 where the gas station. was where they'd met the guys and said that the guys had indicated that the party was in a housing complex just behind that gas station. She described the guys - five of them, Mexican gang types, ages 20-21, heads shaved, wearing baggy pants. She said she thought she might be able to recognize the guy who came on to Teresa. She said she didn't believe Teresa ran away or would ever deliberately stay away without calling us. Our P.I. went to the housing complex and found a cream colored van that matched the description of the van the guys were driving. It was parked at one of the houses. The P.I. got the license plate number and took pictures of the van. She checked out the license plate, identified the owner, and turned all that information over to the police. Nobody did anything. Then, one day, I was attempting to sew up a hole in a clown doll that Teresa loved, and there, stuck in the hole, was a napkin with a telephone number written on it in lipstick! That phone number was (505) 837-8208. It was stuck inside Teresa's doll! I was so excited I phoned our P.I., who told me to put the napkin in an envelope, note the date, time and location of where I found it, and keep it safe until the police came to get it. 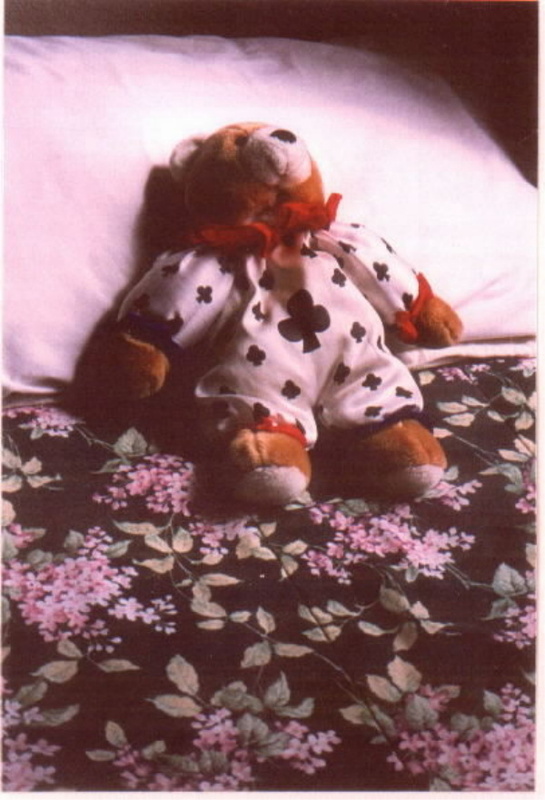 Our P.I., then, called the APD Missing Persons Investigator and told her about what I'd found. The Missing Persons lady was excited also and asked our P.I. 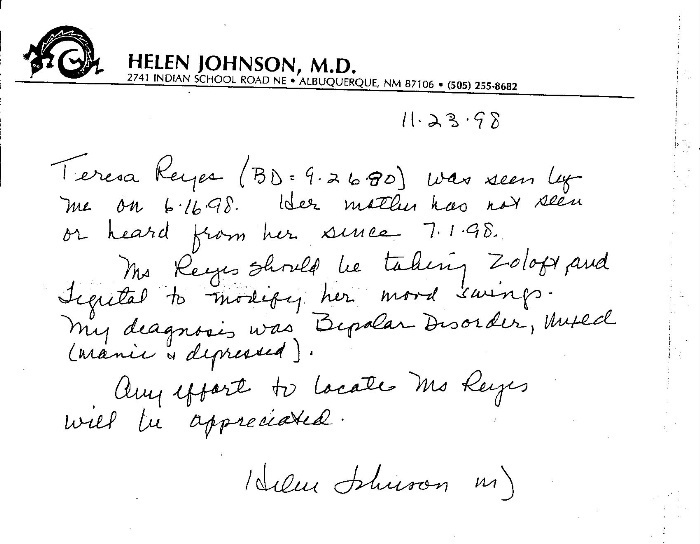 to fax a report of all the case information to her to give to an APD detective. Nobody ever called me or came to pick up the napkin. Our P.I. tried dialing the number written on the napkin, but it was disconnected and unlisted. 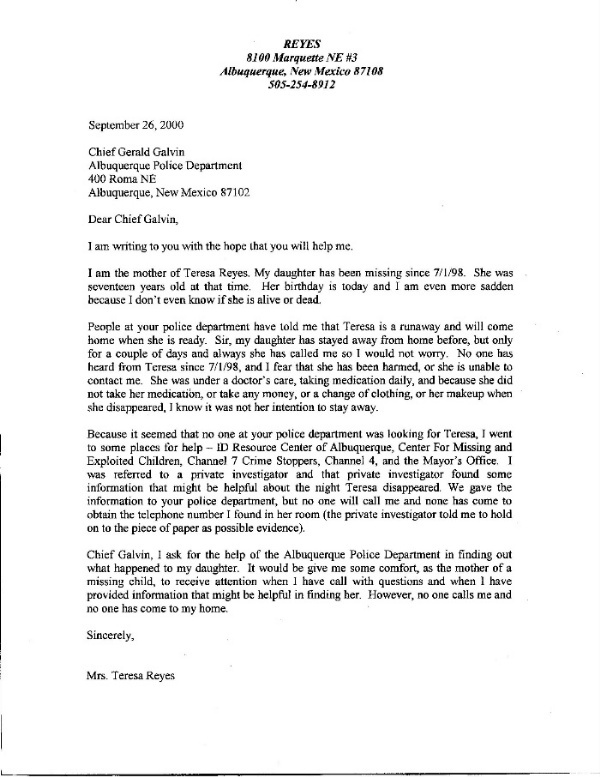 On September 26, 2000, Teresa's 19th birthday, I wrote a letter to APD Chief Galvin,, explaining the situation. I told him, "It would give me some comfort, as the mother of a missing child, to receive attention when I call with questions and when I have provided information that might be helpful in finding her. However, no one calls me and no one has come to my home. Where do I go for help?" because it wasn't long after that before the police came and picked up the napkin. It's now almost a year later, and still nobody has done anything. I know in some level of my being that my daughter is dead. Still, unless the final door is closed, a mother has to hope. Every time the phone rings, my heart starts pounding and I tell myself, "Maybe the police have finally been able to trace the phone number on the napkin!" But it's never the police. I don't think they remember who we are.